My story begins much like anyone who finds out they have cancer. I had finally made time for an appointment with my Gynecologist. Even though my periods weren’t “normal” I had waited. Life was too busy; I have kids, a husband, and a full time job after all! All the reasons most of us don’t make time for what we need to do for ourselves. Once I was in the office, I explained my symptoms to him and he examined me. He took one look at me and said, “You have cancer, I can see the tumor”. I was shocked, devastated and had a million questions that I was too stunned to ask. I was 28 years old and had so much life yet to live! It was 2 weeks before Christmas 2016, and now I had to tell my family that I had cancer. That is one thing I wouldn’t wish on anyone, especially having to tell my mom and hearing the fear in her voice. I looked at my dear children, and with immeasurable fear, I wondered if I would be here to see them grow up. I knew I had to fight the cancer with everything I had in me. Thankfully we found an awesome oncologist who ordered a biopsy and many other tests. In January 2017, it was determined that I had stage 3B Cervical Cancer. The tumor was so large that it was blocking one of my kidneys from draining. The urologist ended up placing stents in both kidneys. There were more tests, more appointments and within a few weeks I began chemotherapy and radiation treatments. During the course of treatment, I needed several blood transfusions, and I developed multiple infections, including abscessed teeth. I had always had problems with my teeth, many filled cavities, caps and occasionally an abscessed tooth. In fact, I had been scheduled to have some teeth removed in February 2017, but that had to be canceled when I it was determined that I needed Chemotherapy and Radiation Therapy. 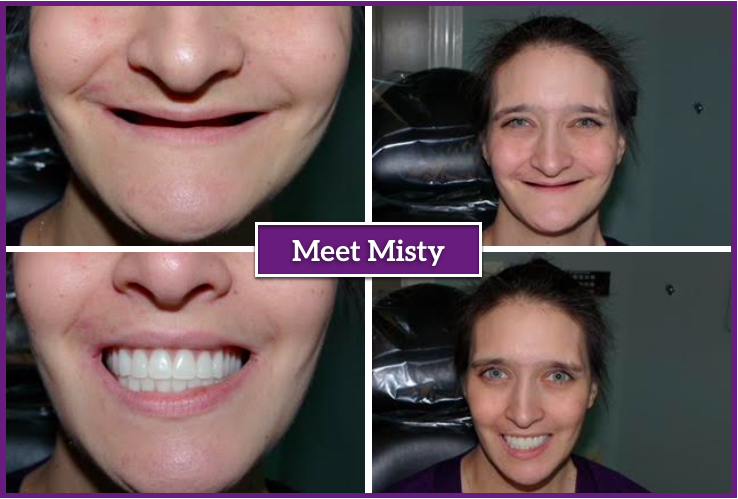 As the side effects of cancer treatments ravaged my body, my teeth only got worse. I developed multiple abscesses, which would swell and pop, causing fever and massive pain. The treatments that were meant to save me were making me very sick and making my teeth so much worse. I was in a real life nightmare! Once I completed all my treatments, more tests were done and by June 2017, I was thankfully declared to be in biopsy remission of my cancer! But, the treatments had taken their toll on me. During the next few months, I needed more blood transfusions, developed one infection after another, and was hospitalized multiple times. I could barely keep any food down, my teeth continued to worsen. As much as I tried, I couldn’t bounce back. I continued to lose weight; in fact I was down almost 90 pounds since my initial diagnosis. I felt even worse than I did when I had active cancer. On October 23, 2017, I was again admitted to the hospital. This time I was in the ICU in critical condition and on life support. I was in respiratory failure, I had severe infections, and I was diagnosed with Septic Shock, kidney failure, severe dehydration and malnourishment and necrotizing fasciitis, also known as flesh eating bacteria. The doctors told my family to prepare for the worst, as my condition was so bad they didn’t expect me to live. My family gathered at the hospital. The Red Cross helped my brother fly in from Fort Bliss, Texas. The doctors and nurses worked hard to save me. They rushed me to surgery that night, and removed most of my lower abdomen to cut out the tissue affected by the necrotizing fasciitis. My fevers continued, and a few days later they discovered that I had multiple abscesses inside my abdomen, so I was taken back to surgery. I showed some improvement and then the fever came back. The doctors then decided that my teeth, which were blackened, broken and abscessed, were another source of infection that needed to be removed. An oral surgeon was consulted and confirmed that it was necessary to remove all of my teeth. A few days later, I was taken into surgery and all my teeth were removed. I ended up being hospitalized for 144 days, with part of that time learning how to breathe on my own, and how to talk and walk again. Now I am home and I can eat a variety of foods, but without teeth it is much harder and limited. My speech is different, I look older, I am very self-conscious and I hate to smile. I feel like people stare at me and judge me for not having teeth. I understand that it was one of many lifesaving surgeries, but the looks do hurt! I really want to fix it but with all that has happened in the last year, it would be a very long time, if ever that I would be able to get dentures. Thankfully a friend told me about Dr. Stevens. She said she had told him my story and he wanted to help me. At my first appointment, I felt welcomed and comfortable. He was patient, kind and answered all my questions. I thank God that this wonderful man is willing to help this disabled girl to again eat foods that I love and speak with my regular voice. But the best part, which I can’t wait for, will be when I can again proudly smile from ear to ear! Dr. Stevens, words cannot express how much this means to me! I sincerely thank you from the bottom of my heart!